RUGBY UNION: Australia's hopes of emulating the 1984 Wallabies side in completing the Grand Slam are over, with coach Michael Cheika left fuming at the refereeing after the heart-breaking loss to Ireland in Dublin. 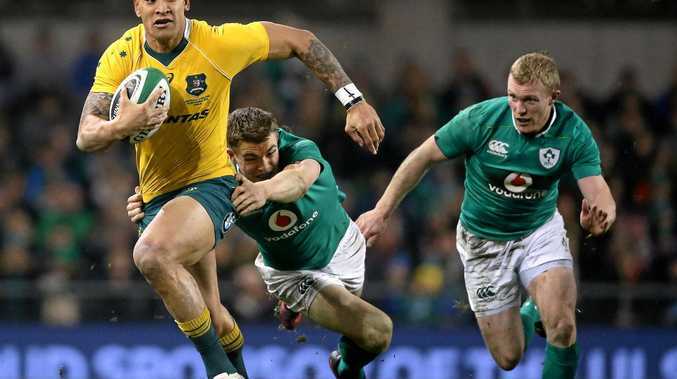 The Wallabies went down 27-24 in a thrilling encounter at the Aviva Stadium, but Cheika was more concerned at the lopsided penalty count, which was 13-3 in favour of the home side. Australia had come back from being down 17-0 in the 39th minute to taking the lead 18 minutes of play later on the back of three straight tries - from Dane Haylett-Petty, Tevita Kuridrani and Sefanaia Naivalu. But Ireland's Keith Earls scored the match-winner in the 66th minute before the home side defended grimly to get the result. Cheika was adamant the refereeing took too much out of his side. "I thought we played a lot of footy in the end but we but we got penalised a lot, didn't we?” Cheika said. "(It was a) 13-3 penalty count and that costs you field position, costs you territory and obviously points as well. Cheika has demanded meeting with a World Rugby referees boss Alain Rolland before next week's season-ending Test against England at Twickenham. "That's something I'll be dealing with Alain Rolland about afterwards,” Cheika said. Ireland lost star flanker Sean O'Brien to a leg injury hours before kick-off, and were also without key playmaker Johnny Sexton. The Wallabies were particularly unimpressed with Ireland's second try, where centre Garry Ringrose split the defence and was rewarded with a five-pointer despite hints of obstruction.